We originally wanted to create a fun and chaotic 4 player game with a space theme. 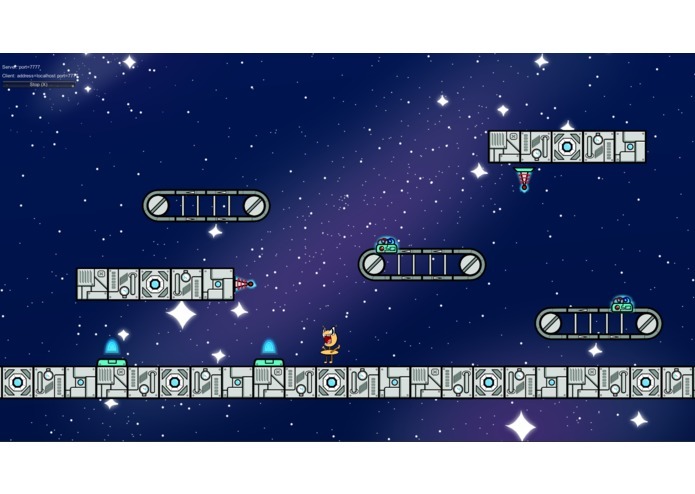 Causmos Chaos (Cosmos Chaos / Cause Most Chaos), is a 2 player arena platformer battle game where the goal is to defeat the enemy as many times as possible using traps. The two players connect through a network to play together. The controls for each player is WASD keys to move, space bar to jump, mouse click to shoot bullets, however, the game as it is now does not work as intended. We built the game using Unity and Unity C#. We drew the art using Adobe Illustrator and Inkscape. All the art is original art drawn from scratch during the hackathon. We had trouble near the beginning figuring out what exactly we wanted to build and whether or not it would be fun. We ended up shifting ideas around for awhile before settling with our current idea. We ran into a great deal of trouble while trying to get the 2 player networking to work. We ran out of time, so we ended up with an unfinished product. We are proud that we had a good concept and a theoretically fun game design. We are also proud of the artwork we created for this game. We learned about networking games, animating skeletons, setting up UI, and various other things in Unity. If we were to continue working on this game, we would finish what we have now, and we can add more traps, more game modes, more players multiplayer, and add additional polish to enhance the overall player experience. I illustrated and animated the characters, created the visual effects, and came up with the name of the game. I implemented our multiplayer networking, scripted some of the weapons, and helped with much of the game's design. Designed the background, platforms, and traps. Scripted a physics based player control system independent of Unity's built-in physics controller. Aided in scripting some of the combat mechanics.